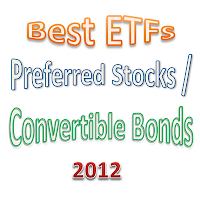 The top 6 preferred stock or convertible bonds exchange traded funds of 2012 are iShares S&P US Preferred Stock Fund, PowerShares Preferred, SPDR Barclays Capital Convertible Bond ETF, etc. If you are an income-seeking investor, you might want to consider preferred stock / convertible bonds ETFs. These ETFs invests mainly in preferred securities or convertible bonds. The ETFs provide higher yield for investors and lower risk than typical stock funds. 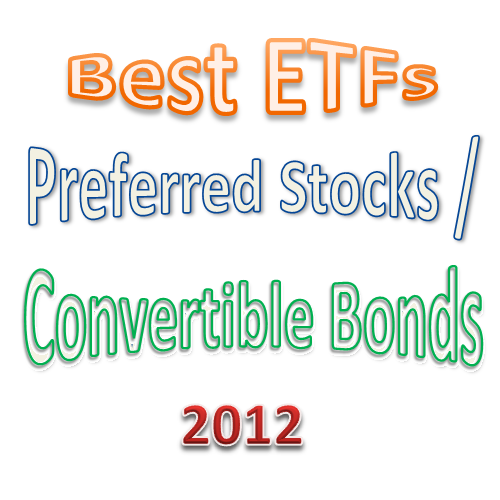 There are currently about 10 ETFs in this preferred stock / convertible bonds category. The fund sponsors include iShares, State Street, Invesco PowerShares, Van Eck Global, Global X etc. The expense ratios are in the range of 0.40% and 0.60%. These top ETFs are selected based on its expense ratio fee, portfolio turnover rate, management or index approach, performance, etc. You can find the fund review and comparison below. This iShares S&P US Preferred Stock Fund aim is to track the investment results of the S&P U.S. Preferred Stock Index. This ETF has yield of 5.89%. The annual expense ratio is 0.48%. It also has $9 billion of assets. The fund has portfolio turnover rate of 16%. This top preferred stock ETF has returned 10.63% over the past 3 year and 4.43% over the past 5 year. Morningstar hasn’t ranked it yet. The top 4 holdings are HSBC Holdings PLC, General Motors Co Jr Pfd Cnv Srb, Barclay Bank Plc, and GMAC Capital Trust I. This PowerShares Preferred Portfolio fund utilizes its assets to purchase the U.S. dollar-denominated preferred securities in its benchmark. It is tracking the BofA Merrill Lynch Core Plus Fixed Rate Preferred Securities Index. It currently has 0.50% expense ratio. The total assets are $1.74 billion. It is introduced to investors on January 30, 2008. This best preferred stock ETF has a 3-year average return of 11%. You can purchase this stock fund from regular brokerages such as Interactive Broker (IB), TD Ameritrade, Think or Swim, Fidelity, Schwab, etc. Ranked with 3 star rating by Morningstar, SPDR Barclays Capital Convertible Bond ETF uses its assets to buy convertible bonds comprising of the Barclays Capital U.S. Convertible Bond >$500MM Index. This fund has 3.38% yield. The 52 week ETF price range is $34.33-$40.30. Its expense ratio is 0.40% per year. This convertible bond ETF has a 3 year annualized return of 8.39%. The top 2 sectors in its assets are consumer cyclical (99.31%) and financial services (0.69%). This investment aim of PowerShares Financial Preferred fund is to track the price and yield of the Wells Fargo Hybrid & Preferred Securities Financial Index. This index benchmark track the performance of preferred securities issued in the U.S. market by financial institutions. The 12-month yield is 6.62%. This ETF has $1.7 billion of total assets. As of August 13, 2012, the fund market price is trading 0.01% premium to its net asset value (NAV). The SPDR Wells Fargo Preferred Stock ETF has a yield of 6.22%. Its expense ratio is 0.45% per year. This fund invests majority of assets in preferred stocks. This index ETF uses the Wells Fargo Hybrid and Preferred Securities Aggregate Index as its benchmark. This ETF has an average volume of 40,693 per day. You might want to use a limit order when you are planning to buy this ETF from your brokerage. This iShares S&P International Preferred Stock Index Fund is a new ETF which was introduced on November 15, 2011. It utilizes its assets to purchase a portfolio of preferred securities included in the S&P International Preferred Stock Index. The total net assets are $101 million. The 30-day SEC yield is 3.46%. With 0.55% expense ratio, this top fund has a YTD return of 5.78%.